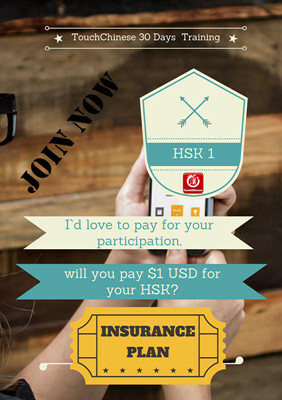 I`d love to pay for your participation, but will you pay $1 USD for your HSK? We built this Vocab group to help all learners to remember the HSK 1 required vocabulary in more systematic and easier fashion. For $1 USD, you can join this special HSK 1 study group. The teaching assistant will assign one vocabulary graph to the Facebook group each day. All participants in the group have to take it as your homework for the day. In 30 days, all the required 150 words would be studied and covered. After the 30 days, there will be a lottery and a winner will be chosen. Then passing HSK 1 is just around the corner. Why you need to join this group and take part in the activity? 1. Conquer your Laziness! Most of the time, laziness is the only opponent. Don’t keep saying “I`ll do it tomorrow!” Day after day, how many tomorrows do you have? Do it right now! Join this everyday activity and make a brand new you. 2. Be apart of a group that wants learn Chinese! You will be in a group that is focused on passing the HSK and more importantly learning Chinese. 3. Try a new effective way to remember the required words! Are you still reciting the single word card? Or are you still turn the textbook on and off all the time? Is it hard to remember these strange basic words? Why not try a systematic new way? 4. It’s only $1! You can’t really say it is too expensive to join this group. For $1 USD, you can get learning material to help you pass the HSK 1 but also learn Chinese! If you follow the plan everyday, you will receive a prize and your money’s worth. 1. When you sign up and pay $1 for this activity, then can you only join this Facebook group and go over all vocabulary graphics. 2. Every time the TA assigns the graphic to the Facebook group each day, the participants need to “like” this graphic in 24 hours. We will record the attendance marks in time. 3. 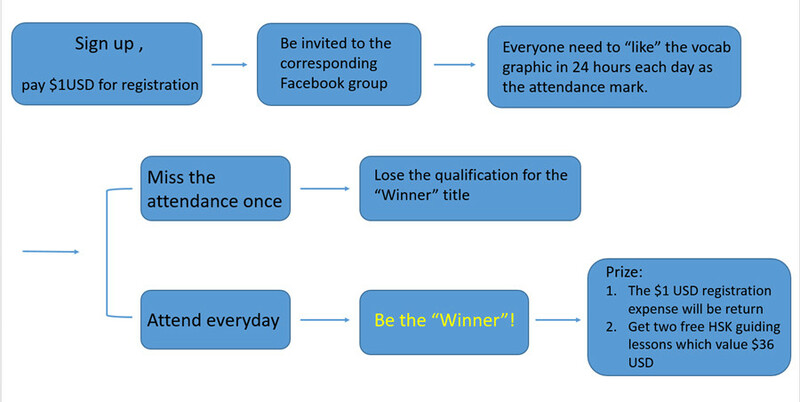 If you miss attendance once, you will lose the qualification for the “Winner” title. But you still have access the learning graphics. 4. If the participants are able to attend everyday, he/she will be the “Winner”. The $1 USD registration expense will be return and the “Winner” can get two free HSK guiding lessons which value $36 USD. That`s the reward of your great efforts in Chinese learning. 1. This is a study group. We don`t allow any irrelevant contents to be posted. There is a warning for the first time. The person will be kicked out without notification for the second time. 2. All the learning content can`t be shared or reposted on any other place in public. 3. Only if there are more than 10 people join the group, the plan would be activated. Or we will return the signing up fee to you.